I recently came across a cook book featuring classic American cuisine. 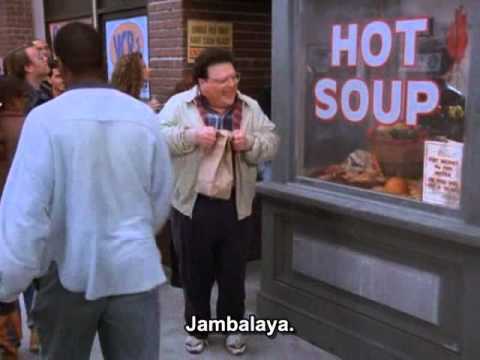 Flicking through the book, I came across jambalaya, and in an instant, one momentous scene in Seinfeld history jumped from my memory. So of course, I had to make it. Jambalaya is a dish from Louisiana, although with significant Spanish and French origins. It’s similar to paella, where meats and vegetables are mixed with rice. The version I made was from the book My New Orleans by John Besh, and included many ingredients guaranteed to induce a heart attack – smokey bacon, chorizo, sausage meat; you should probably plan a doctors visit while you’re cooking. The jambalaya that I made was luxurious, decadent and definitely guilty. It was comfort in a bowl. But while delicious on Day 1, the quality of jambalaya diminished quickly and after foolishly making about 6 L of the stuff, I was left with a rather unfortunately sized mountain of stodgy, congealed rice. Of course, I’m not one to throw-out food so I decided to repurpose it into ARANCINI. 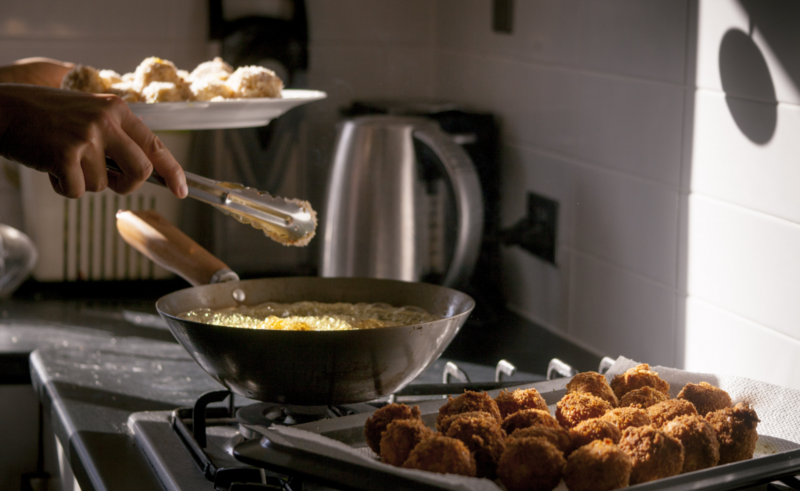 I’m a huge fan of arancini. I love the crunchy shell, the soft, gooey middle and, if lucky, the cheesy centre. 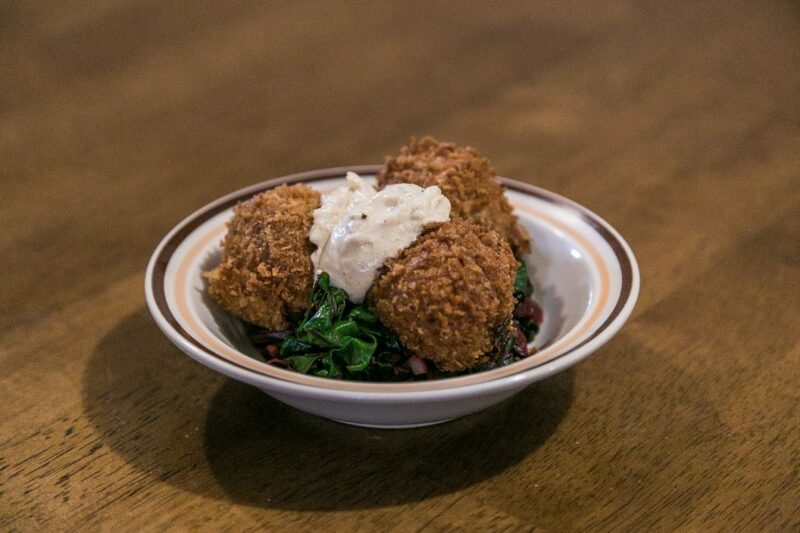 Arancini is usually made with leftover risotto but why not jambalaya? Why not substitute one starch-laden pile for another? So off I went. I rolled my leftover jambalaya into golf-ball sized morsels, before coating with layers of plain flour, egg and panko crumb. I heated oil in a wok and fried them until they turned golden brown. As I scooped them out of the oil, I had a moment of enlightenment, I had just given birth to Jambacini! Crunchy, gooey, smokey, meaty, these jambacini were like a BBQ in a bite. But unlike most arancini that I make, eating jambacini came with many surprises. As jambalaya has a mixture of meats, every bite of jambacini was different. Sometimes I got chorizo, sometimes I got chicken. Bit of sausage meat in one, ooh a prawn in another. Eating these jambacini was like a happy game of Russian Roulette. I leave you now with my very own jambacini. I served mine on wilted beetroot leaves (because I had them in the fridge and didn’t want to throw them out #WarOnWaste) and a ricotta dip. The ricotta was also leftover in the fridge, but also helps to balance the fattiness of the jambacini. Enjoy! To clarify, the ricotta has added lemon for tanginess, so it gives a bit of sour relief to an otherwise salty and fatty jambacini. So yeah, the ricotta still has fat, but it does have a rather cooling and balancing effect from its acidity.